Lucie Jones is the 18 year old singer from Pentrych in Wales who amazed all the judges on her X-factor audition after singing a fantastic version of Whitney Houston’s I Will Always Love You. She managed to sail through the first rounds of the competition, was put into the live shows by her mentor, Danni Minogue, and we fully expected her to go all the way to the finals until she was beaten in the 5th week by Jedward following a deadlock. Information from the ever-reliable internet…. but also confirmed this week in an email from Lucie’s mother to us. In July 2010 Lucie made her West End debut in Les Miserables at the Queen's Theatre, London. BUT, what connection has Lucie to Music in the Vale? 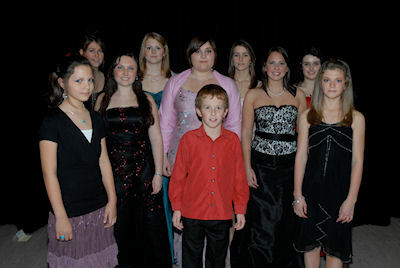 Here she is amidst our 2006 singer finalists. Lucie was a pupil of Radyr School when she entered our competition and then went on to St David’s Sixth Form College. From there…… well, all of Britain knows what came next. Lucie now has a contract with one of London’s top modelling agencies and has done photoshoots with some of the nation’s most popular magazines. Prior to her leap into the public eye, Lucie avidly performed and took leads in plays, musicals and modern dance shows. Lucie will soon be filming The Sarah Jane Adventures for the BBC.